A Crack in the Armor, originally uploaded by jeffsmallwood. Well, I spent some time processing them and wasn't happy with the result. Image this shot as an HDR where you can see everything, and you may realize it would be too much. 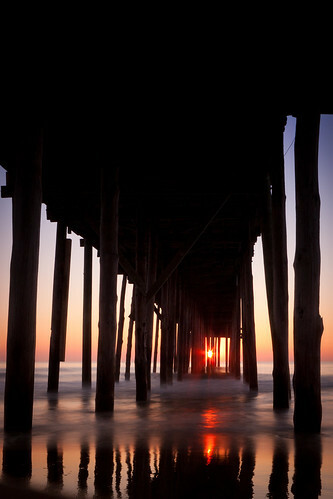 The contrast of the pilings competed with the blur of the water, which competed with the detailed structure beneath the pier, which competed with the sun bursting through the end. The flow that pulls your attention into the shot and toward the sun was totally lost. I went back to a single exposure and decided a strong, dark top to the shot was a much better anchor for the frame and didn't overly distract from the flow. You may not agree, but that's the vision I was going for. This shot definitely reminded me that sometimes less is more.